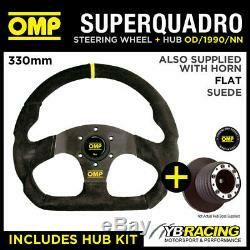 SEAT LEON MK1 ALL 01-06 OMP SUPER QUADRO FLAT BOTTOM STEERING WHEEL & HUB KIT. MOTORSPORT PARTS > STEERING WHEELS > WHEEL & HUB COMBO. IN STOCK AVAILABLE TO ORDER TODAY. Airbag Warning Light Bypass Cable Supplied. 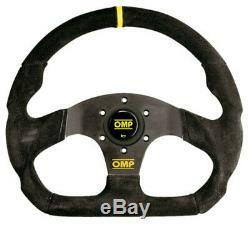 OMP SUPER QUADRO STEERING WHEEL. SUEDE LEATHER WITH YELLOW STITCHING. BLACK ANODIZED SPOKES WITH OMP LOGO. This product has no reviews yet, however see what our buyers say about our other products.. How is my item posted? We use Parcel Force 24/48hr services in the UK, Euro48 service to Europe and Scheduled service to worldwide destinations for larger or high value items. Roll cages and larger items are sent by a specialist courier who does charge us more for this service. How is my item packed? Your item is treated with great care and attention, most OMP products are boxed, and then bagged, and all larger items are protected by strong boxes. Smaller Items are bubblewrapped where necessary. What should I do when the courier delivers my item? If you later discover your item has been damaged by the courier but you did not sign for it as damaged, then we cannot make a claim off the courier for the damaged goods. This service is not tracked or insured. This service is not trackable. Tracking in the UK and in some overseas destinations. Compensation for loss or damage up to the item value. Parcelforce Express 24 (UK) - Suitable for sending items on a guaranteed next day service to mainland UK. Parcelforce Express 48 LARGE (UK) - Suitable for sending larger items such as seats, roll cages, sumpguards, which are outside the size limits for standard Parcelforce Express 24. And we will be happy to assist you further. This service is tracked and insured. We can collect from any UK address on a specified week day for your convenience. 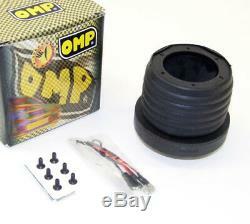 YB racing are proud to be one of the largest OMP suppliers in the world and one of only five official UK dealers. We carry huge stocks in our UK warehouse and have a fast efficient service from the OMP factory in Italy that we have direct links. YB Racing was established in 2003 and has been successfully trading for the last 14 years. We have a fantastic relationship with OMP in Italy and this is key for us in delivering a great service to you. We have thousands of happy satisfied customers from all around the world. OMP products are used in Formula 1, Rally, Karting, Race and Touring Car Championships, whilst top racing drivers from all around the world rely on OMP racewear in international motorsport competitions. We sell the entire range of OMP products including seats, harnesses, roll cages, steering wheels, clutches, brakes and also their world renowned racewear range that includes race suits, gloves, boots, underwear, helmets. Other items in this category. The item "SEAT LEON MK1 ALL 01-06 OMP SUPER QUADRO FLAT BOTTOM STEERING WHEEL & HUB KIT" is in sale since Thursday, June 8, 2017. This item is in the category "Vehicle Parts & Accessories\Car Tuning & Styling\Interior Styling\Steering Wheels & Boss Kits". The seller is "ybracing" and is located in Lancashire. This item can be shipped worldwide.